There used to be a time when those from the East and West coasts scoffed at the idea of fresh fish in Chicago beyond Shedd Aquarium. Thankfully those days are long gone as the majority of the Windy City's seafood-focused restaurants see daily deliveries of the best crustaceans and fish in the country. It also helps that the top spots gleefully showcase them, from inventive seafood boils to chef-driven presentations. And while some restaurants are long-time favorites, others are contemporary, sleek and considered the hottest seats in town. Here are some of Chicago's top seafood restaurants. The Gold Coast outpost for this mini-chain of upscale seafood restaurants sets itself apart because of its distinct oyster bar, located on the first level. It serves as a draw for after-work and post-shopping on the Mag Mile gatherings with plenty of bar and high table seating. Oysters are freshly shucked by the order by a dedicated team who are also well versed in bivalve mollusks. Other highlights of the oyster bar's menu include big eye tuna poke, lobster pot pie, corn-flake fried oyster sliders and a hearty fresh fish selection. Devon's downstairs dining room is reserved for the full dining experience, where guests may indulge in prime steaks and seafood entrees. Highlights include signature dishes such as char-crusted Ahi tuna, shellfish bouillabaisse and jumbo lump crab cakes. It's good to know that a great--and inexpensive--seafood spot is located within walking distance to Wrigley Field. Fish Bar, small ad cozy, offers a number of fun options, including raw (ceviche, tartare, oysters), spreads (smoked whitefish, salmon), seasonal fish tacos, crispy (calamari, hush puppies, whole smelt) and on a bun (lobster roll, spicy Mahi Mahi, oyster Po'Boy). Fun libations like local craft beer selections and The Old Man and the Sea rum-based cocktail named after Ernest Hemingway's final novel add to the experience. Helmed by star chef Giuseppe Tentori, this fashionable fish house in River North delivers on its promise of superior food and drink choices. The most coveted seats in the house are at the raw bar, where guests may indulge in freshly shucked oysters. Other obsessions include mussels, a lobster roll, and ever-changing pasta dishes. The biscuits & lobster gravy, shrimp & grits and smoked whitefish quiche are popular choices during weekend brunch, which is one of the very best in the city. Sibling and next-door neighbor to Gibsons Steakhouse, the scene-y Hugo's in the Gold Coast caters to residents, visiting celebrities, and local power brokers. Yes, there is actually a frog dish on the menu--sauteed frog legs with garlic butter--plus classic seafood dishes like shrimp Dejonghe, beer-battered fish & chips, and whole Maine lobster. The fresh fish selection is pretty impressive and preparations change on the regular; choose from the likes of Yellowfin tuna, swordfish, grouper, salmon and sea bass. Messy seafood boils are all the rage in the Windy City with the likes of The Angry Crab, lowcountry and Mad Boiler at the forefront of the trend. Messy is actually an understatement as diners are given plastic bibs and gloves so they don't get sauce all over themselves. An experience at the West Loop's Mad Boiler is best enjoyed with a group, as it's an excuse to order pretty much the entire menu. The adventure begins when guests select from 11 priced-by-the-pound seafood offerings (e.g. crab legs, crawfish, Dungeness crab, lobster, mussels), then choosing sauces (e.g. garlic butter, sweet chili, Louisiana-style, coconut curry) and a spice level ranging from mild to full-on heat. Toss in corn-on-the-cob, potatoes or sausage and you've got yourself a feast. Other choices include clam chowder, fried soft-shell crab, shrimp Po'Boys and lobster rolls. Located on the first level of Thompson Chicago Hotel, James Beard winner Paul Kahan spotlights an Italian-focused and seafood-driven menu with rising star chef Erling Wu-Bower. Specialty hand-made pasta, fresh seafood and raw-fish preparations such as crudo are some of the highlights. The menu, of course, is seasonal, and an ever-changing menu of brunch and breakfast items are also offered. One of our favorite child-friendly destinations, Shaw's is also a popular after-work hangout for adults because of the Oyster Bar, which showcases live blues and jazz several nights a week. The restaurant aggressively offers seasonal shellfish and other seafood as well as sushi. 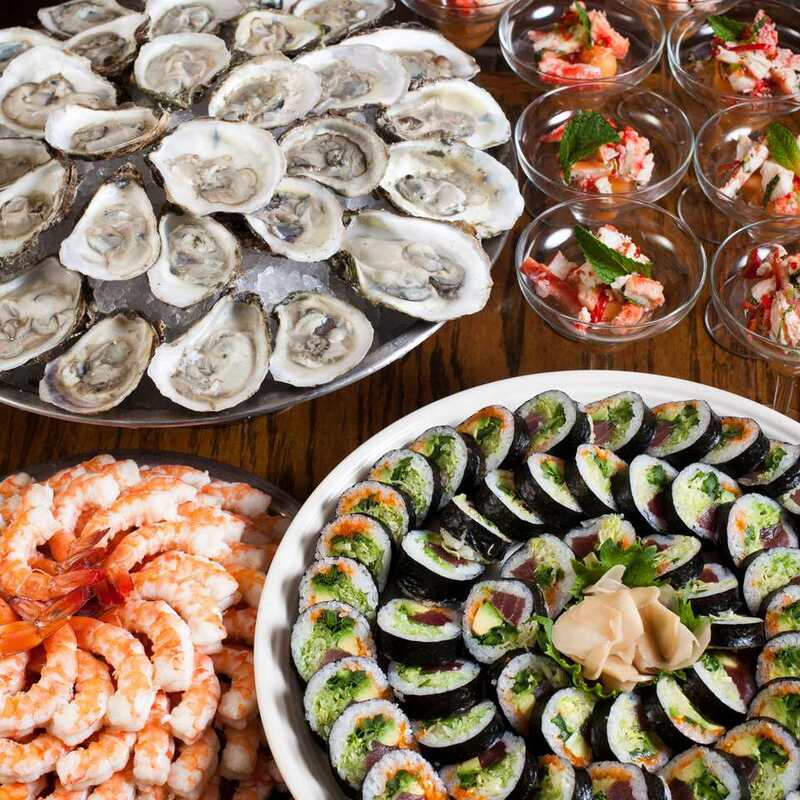 For $55 each, diners are treated to a massive weekend brunch buffet that is primarily filled with seafood. Some of the highlights include French-fried shrimp, caramelized smoked bacon, doughnuts and baked apple French toast.